BELIZE CITY, Tues. Apr. 14, 2015–An accused murderer who has been waiting for his day in court for almost five years, learned this morning that he will have to wait a bit longer after the trial judge, Supreme Court Justice John “Troadio” Gonzalez, aborted the trial, which had just began yesterday, Monday, and sent the jury home. Raymond Myers, 30, who has been accused of the May 2010 murder of Francis Figueroa, 27, was sent back to prison to await a new trial date after one of the jurors informed the court that he is a Jehovah’s Witness, and as such, is unable to sit in judgment over someone. Justice Gonzalez questioned the juror, asking him why he had not said something before. The juror replied that he did not quite understand his role as a juror, and it occurred to him that he would have to pass judgment on the accused man. The juror asked to be excused from the case and the judge was left with no other alternative but to grant his request and dismiss the entire 12-member jury, which had been empanelled to sit on the case. Myers, however, may not have to wait too long, since it is expected that a new jury will be empanelled to sit on his case as early as this Friday. 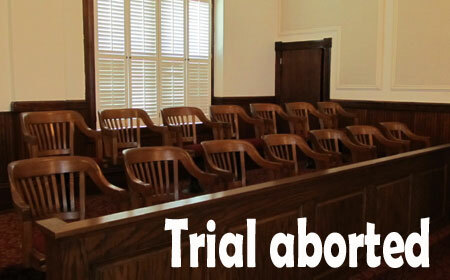 Since the trial began yesterday, three witnesses had already testified. Those witnesses will have to reappear to give their testimonies to the new panel of jurors. Figueroa was stabbed to death in a fight in the vicinity of the Fish Market on Vernon Street, in the Conch Shell Bay area, and police charged Myers for his murder.